(CBS/KBOI/AP) WASHINGTON - Oscar Ramiro Ortega-Hernandez, the Idaho man charged with shooting the White House and trying to kill President Obama, claims in an internet video that he is the second coming of Jesus Christ. 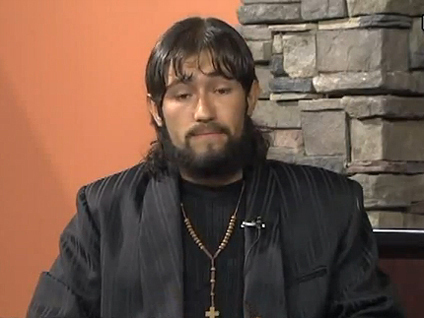 Ortega-Hernandez was arraigned Thursday in Pittsburgh. He allegedly fired nine shots at the White House last Friday with an assault rifle. One bullet hit a window in the 2nd floor living quarters. The president wasn't there and no one was hurt. Ortega's car was found abandoned nearby shortly after the shooting; an assault rifle with a scope and nine spent shell casings were found inside. Ortega-Hernandez has been quoted as calling Mr. Obama the "Antichrist." "It's not just a coincidence that I look like Jesus. I am the modern day Jesus Christ that you all have been waiting for." If convicted of attempted assassination, Ortega-Hernandez could face life in prison. In a 20-minute video posted by CBS Affiliate KBOI, Ortega-Hernandez claims to be the second coming of Christ, and talks about Nostradamus and receiving a "message thorough time." "When I first saw that, there was no doubt in my mind that the message sent through time was solely for me," Ortega-Hernandez said. The student who filmed the video, Ramon Bailey, told KBOI that he randomly met Ortega-Hernandez and was approached by him to film a "commercial." Bailey hesitated, but gave in when the phone calls wouldn't stop. The taping disturbed Bailey so much he never edited it and did not return Ortega-Hernandez's calls. Bailey has been subpoenaed to testify in front of a grand jury at a district court in Washington D.C. on November 22. He reportedly told an acquaintance that President Obama planned to implant computer tracking chips into children. But his mother said he has no history of mental illness.